I'm using waxed string to tie off this hand tied bridal bouquet. 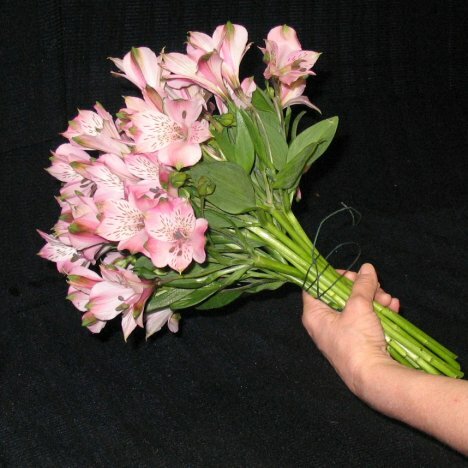 The wax is gentler on the stems and won't cut the flower stems in two. An Oasis product is called BindIt. It works on hand ties as well. It is a little trickier to manage, but makes a smooth, tight seal that is flatter and smoother under ribbon wraps. You can do this two ways. 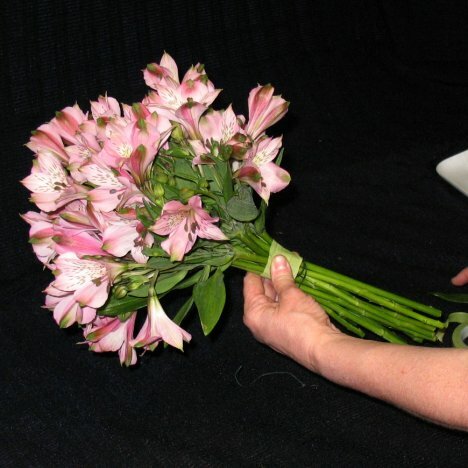 If you have a helper, you can gently encircle the stems with both of your hands and lift them out of the vase. 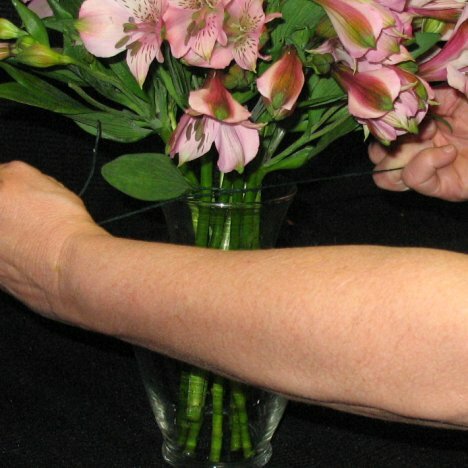 Tighten your grip until the flowers are firmly pushed together and be sure the stems look the way you want. 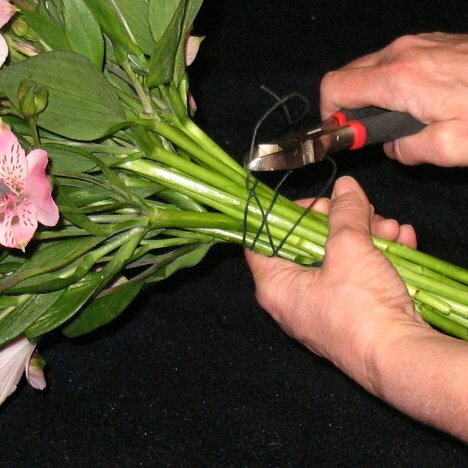 If they are all in place and look good, have your helper tie off the flowers with the wax string. 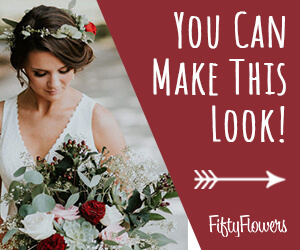 If you don't have help, imply cut a generous length of the wax string and encircle the bouquet with it while the flowers still rest in the vase. Surround the bouquet right above the lip of the flared vase. 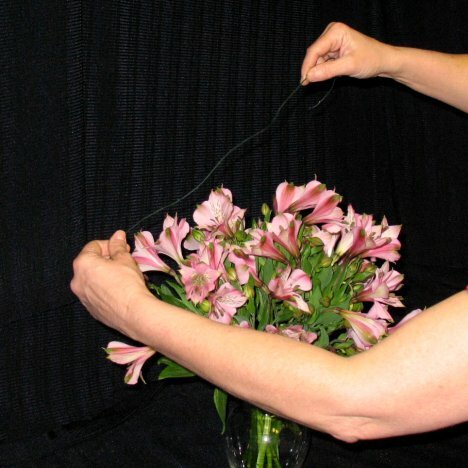 Gently pull the wax string taut, pulling all those flowers stems tightly together. Wrap another time around the bouquet, with the second string the same as the first. 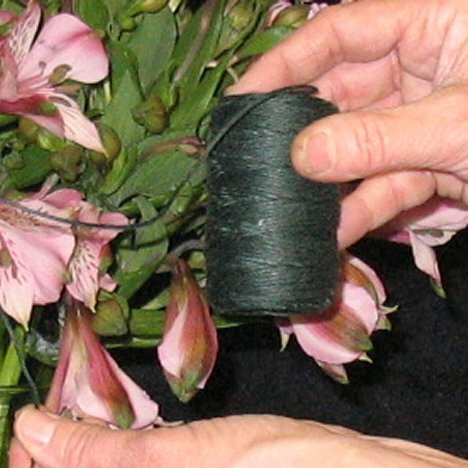 Tie off each string with square knots, then clip off the ends of the wax string with wire cutters or sharp scissors. 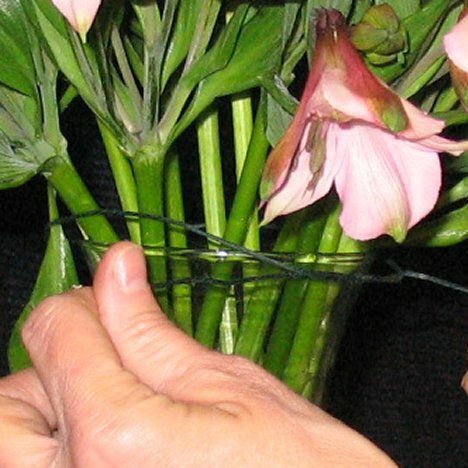 Be sure the flower stems are tight so they won't slide around loose inside the string tie off, allowing the flowers to shift. 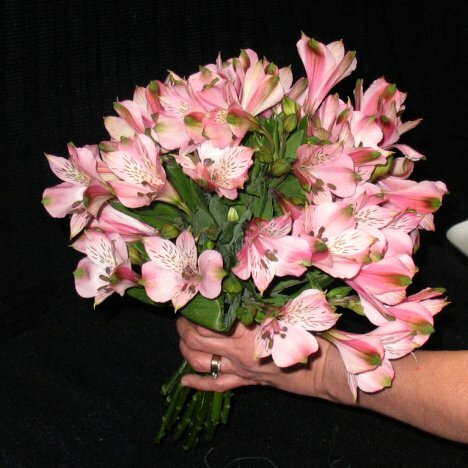 You now have a graceful, softly rounded hand tied bouquet. I generally follow up with a few wraps of stretchy green stem wrap to smooth out the place where the string is knotted. 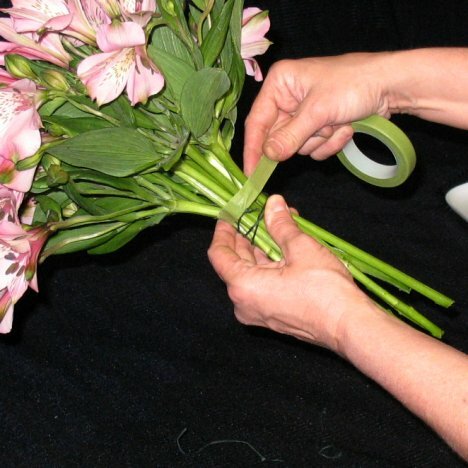 If you use Bind It, you will already have a smooth handle with no need of florist tape. Wind it around and over the string, pulling gently so that the tape adheres to itself and stays fastened tightly on the bouquet handle.